When do you get the rear seat covers? He covered that in the posts. They were custom made by the same people that made the front seat. Probably now an open stock item from the same company since they have the patterns. I saw the post and pics but didn't see where he had installed them. I figured out a solution to my missing and NLA rear door drip/moisture barrier. I looked at drop cloths and vapor barrier at my local big box building supply store and everything I found was very thin, only about 4 to 10 mil... Then in a random thread on Rennlist, a Porsche forum, someone suggested using a shower curtain. A trip to Walmart and for $9.00 I bought the "heavy" duty variant and this was much thicker and close to the original's thickness. I replaced the cracked shifter surround, though in a modified way. I grab these surrounds whenever I find a good one at my local pick n pull and have experienced that it's not unheard of to break the shifter handle trying to remove it. Not wanting to risk this with my handle I decided to modify my surround. On the face closest to the dash I cut a small slit that allowed me to spread the surround open enough that it stippled around the shifter stalk without having to remove the handle. I did this in a jig I made on my table saw with a very thin kerf blade, but a band saw would be preferred for an even thinner kerf. Once installed you can see a line where the spilt is, but not too noticeable. A small sacrifice for not having to risk breaking my shifter handle. Sometime the small finds are the most satisfying. Inside a cracked center console at the pick n pull was the cubby fabric insert that mine was missing. A quick cleaning with some dish soap and it was a good as new. 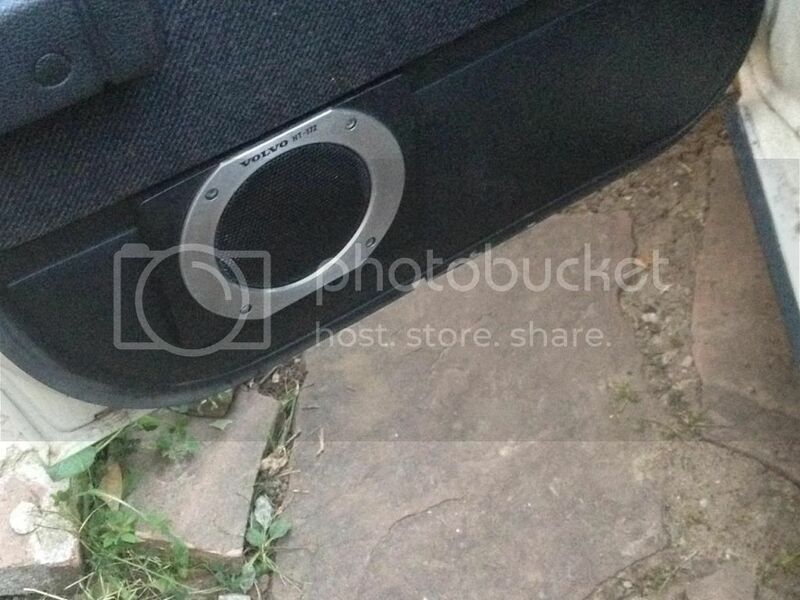 mblue240 got me thinking about Volvo speakers. I found these out of an 850 I think and hooked them up in place of the door speakers and they work. They could be mounted on the back shelf, but the metal under the shelf would have to be cut so they could be mounted flat and I am not sure I want to do that. I have to think on it. It's the little things that make it worth while. How many cans of paint should I buy for the carpets? Once I figure that out I should also have a better idea of what I’ll need for the wagon’s cargo compartment. I can't find a pic on google, but I think the 940 or 740 would have speakers for you. I've never owned those models, so I'm not super familiar, but I recall pulling out speakers that sat on the shelf. In all my years of hunting I've only found 1 set each of the speakers from my original post. When I flipped them on ebay I was surprised to find they paid for my next few junkyard trips. I actually just found the correct 240 rear deck speakers out of a GL model that was in my local pick n pull. I will use the housings, but probably upgrade the speakers. Any suggestion on speakers? Last edited by MSGGrunt; 08-04-2018 at 05:48 AM.. The rear parcel shelf in the GL was beyond being usable, but it will serve as a nice pattern for cutting the holes in my shelf. The added benefit of the GL speakers are that I still get to move the speakers from the rear doors to the shelf and the holes are already in the rear shelf panel, so I wouldn't have to cut anything like I would to fit the newer 850 speakers. And all original 240 bits. Does anyone know what these speakers looked like when new? It appears there was something glued on the top of the trim pieces? Whatever it was actually pitted the plastic, so I will probably just end up cleaning, prepping and filling in the imperfections with some spot putty and then priming and painting them. They had a ring with the word Volvo printed on it. Similar to this pic although I think the ring was a silver color. I think those are the ones I'm sitting on too! Though it would be nice if they had the silver trim still on them, I feel for my purposes a good sanding, spot putty to fill in the minor imperfections, primed and then painted will be fine. These are after all hidden on the rear shelf behind the headrest, so sort of out of site. And I will probably paint them tan to match the rest of the interior. The leather for the rear seat finally arrived. It has been "relaxing" in the hot sun in the car waiting for me to find the time to install it. In the mean time I cleaned and installed the final door panel on the driver's side and swapped out the black door locks for the tan ones that came in the 940 that I bought for the turbo motor. Looking good! Waiting to see the rear seat covers installed. Ordered a set of Johann245's custom wood dash trim. I chose the darker Bolivian Rosewood. I am hoping the darker trim pieces will add a subtle richness to the interior without standing out too much. I'll be sure to post pictures in a couple of weeks once he has finished making them and they are installed in the car. I have been very busy with work over the last few weeks, but hopefully I have a little break coming up to get the rear leather installed. Had a chance to see these L-seat covers in black leather. Customer had an 90 240 white with black interior. Install was nice, leather felt sturdy, color was more a matte finish. Looked good. Your car should turn out nice too. The current dash in the car has one of those formed ABS covers glued in place, presumably to cover up cracks. While it doesn't look too bad compared to a badly cracked dash, I did grab a perfect dash out of a 1979 240 at my local pick n pull. Will this work in my newer 240? I just don't know the differences, if any, between the earlier models vs the later models. The dash is completely different. Sell the 79 dash here and look for 81 and up to 89. 1990 and up will also work but there but there are small differences that will drive you nuts. The hole for the ignition is slightly off and that piece uses a different housing. This makes the center panel different to accommodate the extra piece. Th pen tray section is what's different between the 81-89 and 90 -93.